LOA/LWL - 42'6" / 35'10"
Beam / Draft - 12'11" / 6'2"
Interior head room - 6'6"
Listed for sale is Chotto, a 1983 Slocum 43 that has, between 2009 and 2016 been professionally refitted, upgraded and improved to enable single or shorthanded (just a couple) sailing. In 2016 she was sailed to Florida and back by a couple and now is on the market and ready for her next journey be it across the bay, the gulf or the Atlantic! Chotto is a beautiful 43' cruising yacht that is well founded and constructed. Her underbody is a modified fin with a skeg providing excellent turn of speed as well as comfort in all types of seas. In order to facilitate short or single hand sailing, all her lines have been led aft, Harken st40 two speed self-tailing winches, Strong track, harken traveler, Facnor furling on the jib and staysail and Garhauer clutches were installed. 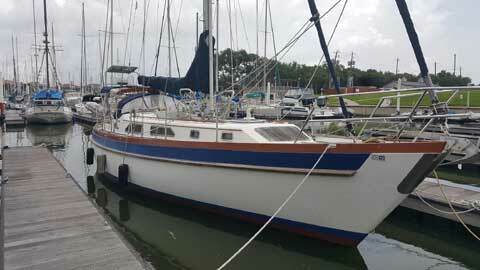 Chotto was frequently single handed up and down the gulf coast and has proven her ease of use. In the all-important galley, there is a Force 10 propane stove, new and upgraded water pumps for fresh and salt water as well a Frigaboat spill over reefer and freezer that keep drinks and food nice and cold. These systems were installed and or upgraded between 2010 and 2016 with the Frigaboat having a routine maintenance service in 2017 (seals, etc. as recommended by the manufacture). 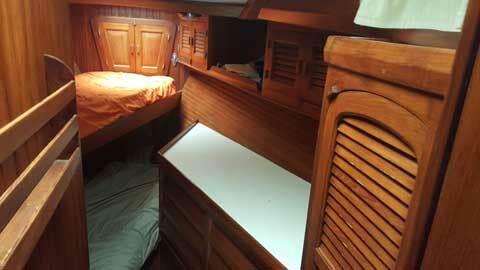 Chotto has a master cabin aft of the galley and to port of the companionway. 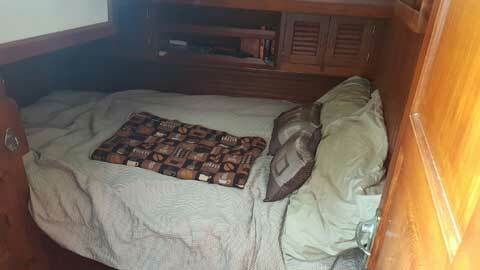 The master bunk can accommodate someone up to 6'7" and is plenty for 2 people. The cabin has its own quite fan, lighting and great port lights. For double handing it's convenient to the cockpit as well as the galley. To the starboard of the companionway is a pilot birth that is perfect for either immediate need storage or a sleeping off duty crew. Under the aft cabin deck are the AGM batteries that were installed in 2016. They are maintained via a Charles 100amp charger as well as solar. The 180w solar panel and charger were installed in 2016. Forward of the pilot berth is a spacious wet locker for your foul weather gear, boots and other immediate supplies. Under the companionway is storage and is used for all offshore equipment such as jack lines, gloves, etc. Chotto is a well-equipped yacht for offshore with almost too many upgrades and equipment to mention. Forward and starboard of the wet locker is the comfortable and large navigation station with a large chart table, storage under the table cover and chart storage under the table itself. This is also where you can monitor the systems via the bluesky system, genset controls and propane scelenoid. 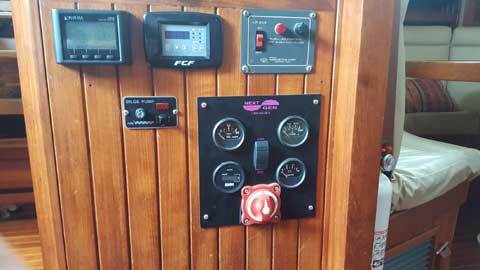 The windless and genset switches, all upgraded, are also at the nav station. The genset is a NextGen 5.5kw and provided reliable power for the microwave, 110v fans, battery charger or at anchor, in those hot days - the AC! 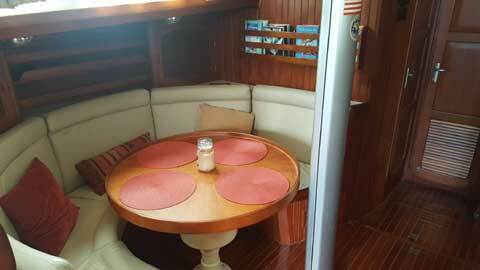 Mid cabin you'll find a circular settee and table with an integrated wine or liquor bottle cabinet on the port side and a straight settee on the starboard. Behind and under the settees you'll find cabinet and storage. 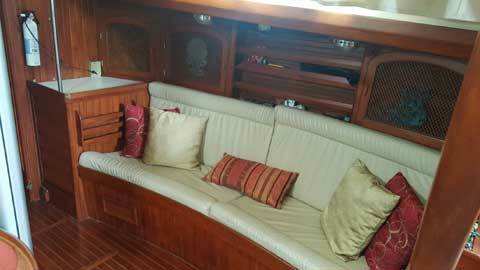 All cushions were redone in faux leather and have new foam and all lights, both internal and external, are LED (including red lights for night sailing). Under and in back of each settee is ample storage as well as a Wabasto 16k Btu reverse cycle AC/heat to keep you cool or warm. Under the main cabin floor is also where you'll find the engine. The engine is a rebuilt Perkin 4108 50hp with a rebuilt BorgWarner hydraulic transmission. Forward of the engine in its own areas is where you'll find two 75gal water tanks and forward of that you'll find sail storage. Befitting a true blue water boat, Chotto is not wanting for storage! Forward and to port of the main saloon is the head. 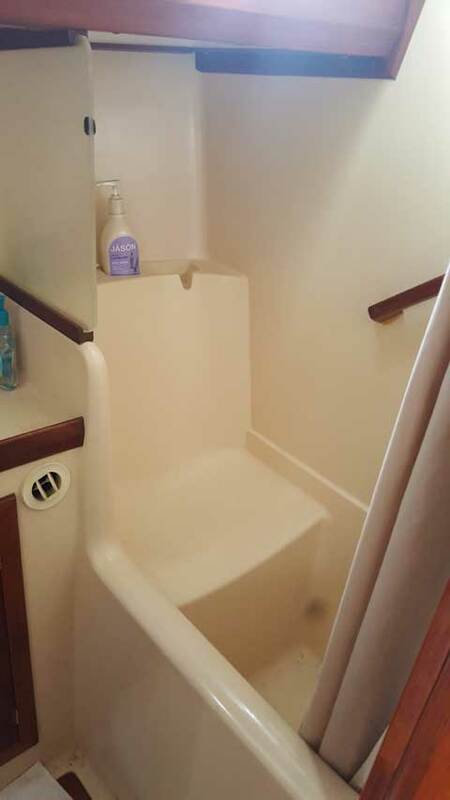 Unlike many cruising yacht, Chotto has a shower and small tub separate from the head itself. This makes for great privacy, clean up and provide a variety of uses. The head itself was replaced in 2010 and pumps replaced in 2016. 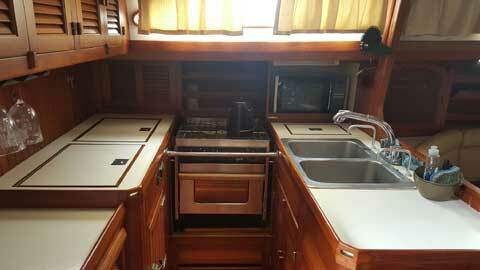 In the head, as well as the galley, there is both hot and cold pressure water as well as foot pumps for fresh water. The shower drains into a separate gray water holding tank that can be emptied via an internal pump. The head itself empties into the holding tank with pump-out ports topside. There is also a y valve for offshore operation. Starboard of the head is yet another hanging locker for dry clothes and equipment as well as drawers to use as needed. Moving forward is where you'll find a comfortable cabin with two separate bunks, its own hanging locker, numerous cabinets and draws as well as counter space. This cabin has 3 separate lights and a whisper quite fan. Forward of the cabin is the chain locker where you'll find 400' of galvanized chain leading to a Nilsson electric windlass and a 2016 mantus anchor. At anchor, the combination will and has provided comfort and safety in even the roughest storms. The windless is powerful and simple and helps you eliminate that back breaking effort of raising the anchor. Easy to accomplish single handed too. And to facilitate a clean boat, the salt water wash-down is right next to the windlass and provides an easy way to clean the chain and anchor as well as the boat herself. Now let's talk sailing!!! Ease of sail handling is what it is about and Chotto provides that. The forestay and inner stay both have Facnor furling on them and the main has a Strong Track. The Strong Track allow for ease of raising and lowering the main, even in a blow and even downwind!! The furlers are proven tough and are a nice feature when needing to reef the headsail. In order to control most of this, the lines have been led aft so no leaving the cockpit. You can control the new harken traveler, raise lower and reef the main, control the boomvang and more all from the comfort of the cockpit. Get a Wincher and it would all be effortless. The jib winches are 2 speed self-tailing and provide as of use in trimming. 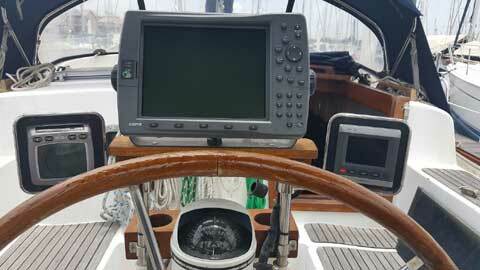 Via her current setup you can trim her to sail on her own and gain maximum speed or sit back and just cruise easily. Sails were new in 2010 and include the headsail (110), staysail and main. There is a spare main, a new working jib as well as a trysail for storm sailing. For lighter air there is a 150 genoa. Again to facilitate single handed sailing the main also has lazy jacks for dropping and gathering the sail. Working all this required newer and stronger running rigging as well as new turning blocks and sheaves which were installed between 2010 and 2016. Lastly, at anchor you need a taxi and Chotto's has an Avon 10' rib with a 2016 Tohatsu 9.8 outboard. Outboards can be heavy so a new Garhauer outboard lift was installed to lift the motor to the mount on the aft rail. 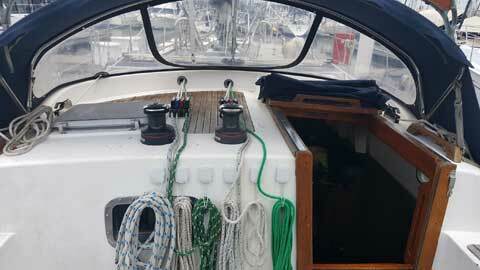 And since dingy aren't light either there are davits with 4-1 blocks to lift the dingy up and out of the way. Lastly, there is also a ladder to get from Chotto to the dingy. No jumping or falling! Over the davits you'll find the 180w solar panel installed in 2016. The panel is installed high to provide optimum sun exposure and limit any potential shade. Chotto is ready to go... load your provisions, clothing and personal items and she'll take you into the bay, the gulf, the Caribbean or anywhere in the world. Chotto has had two owners and only 2 for her entire life. The current owner has had her almost 10 years and the original owner had her almost 26 years. With the original owner Chotto has been to the Indian Ocean, South Pacific, Caribbean and the Gulf and all on her own keel! She's a proven off shore yacht.